I’m beginning to worry about my shoveling addiction… After my last morning clients left on Monday, I pulled out my shovel and started to shovel wet, heavy snow off of our upper deck and the stone steps on the side of our house for the next hour. It didn’t need to be done and most of it would have melted on its own by Thursday; however, I couldn’t help myself. I look at it as a great functional workout! Tuesday I met up with my friend Tracy for a run along the streets near her house. 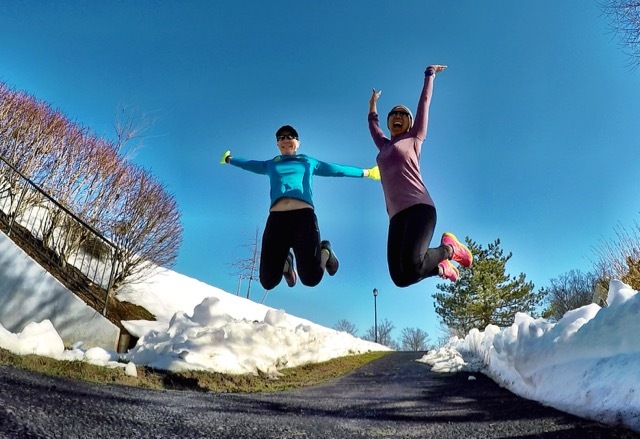 We actually found a couple of trails half-way clean, so we jumped for joy! 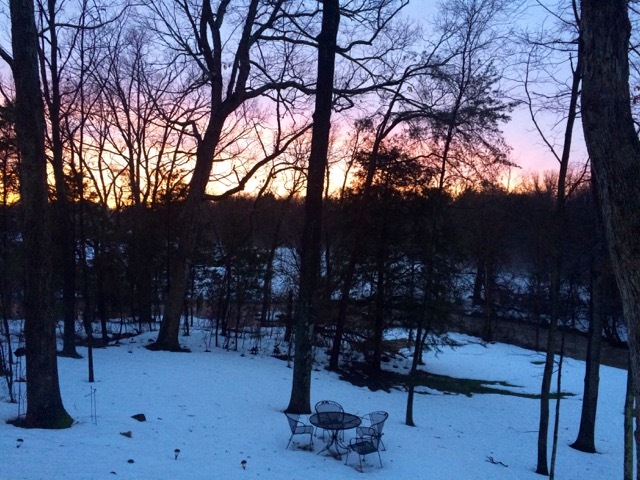 We’ve had some amazing sunrises and sunsets recently, and I took a picture of Wednesday’s sunset to show how much the snow has melted. Two weeks ago today the snow was up to almost even with the table top. As of today, we can see the stone patio under the table and chairs. Thursday morning I met up with my MRTT friends at 5:30 AM for my first super early morning run of 2016. There’s just something about getting out of bed at 4:30 in January that I don’t seem to be able to do. Unfortunately, that means many of my runs have been alone later in the day. After Stella’s and my run, I headed to the trail behind my house, but after about a mile I gave up. The trail was in great shape at places; however, it was a crunchy, uneven, snowy frozen mess at other places. Not wanting to risk injury, I headed back to my neighborhood street. The wind kicked up and it got quite chilly and miserable for the rest of my run. After my morning run, I rushed to Wegman’s to pick up a couple of things I couldn’t find at the other Wegman’s the day before. While at Wegman’s I found these, but didn’t buy them since I had two people brining desserts to our dinner party. 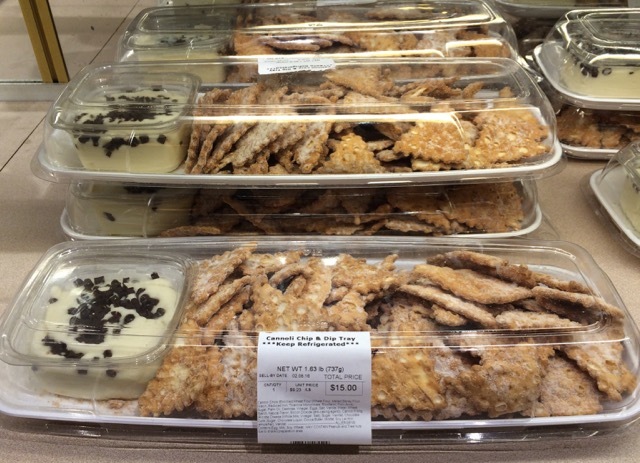 Cannoli – my kind of chips and dip! 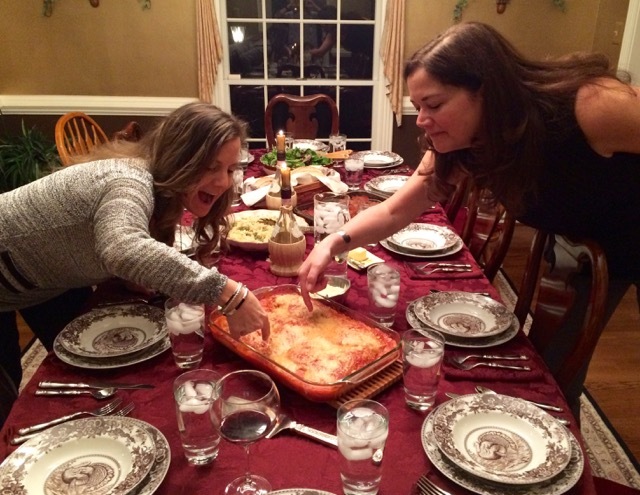 And speaking of the Italian dinner party, it was a huge success! My chicken parmigiana and beef brociola turned out great, even if I do say so myself. Even though not every guest was a runner, this year I served pasta shaped like little running people and running shoes. Look closely! I caught Susan and Vel goofing off in the dining room before the guests were seated. They didn’t really dig into the chicken parmigiana! I trained two clients this afternoon, and the second they left I threw together my favorite Texas layer dip. It’s one of my favorites, but I only make it as a special treat once a year for the Super Bowl. That’s another specialty of mine setting next to the dip – a pomegranate margarita. I’ve been wanting to add yoga back into my routine, so I ordered Rodney Yee’s Complete Yoga For Beginners, Intermediate Yoga, and Conditioning For Athletes DVD’s (affiliate links). Sadly, it’s been too long since I practiced yoga regularly, and I decided that it wouldn’t hurt to have a little bit of a refresher course as I dive back in. Don’t forget that you have just a few more hours to enter my giveaway which ends at midnight. Check out my review of the Halo all-in-one headphones and headband from Tuesday, and enter for a chance to win your own Halo Headphone. The chicken parmigiana and the layered dip looks awesome! 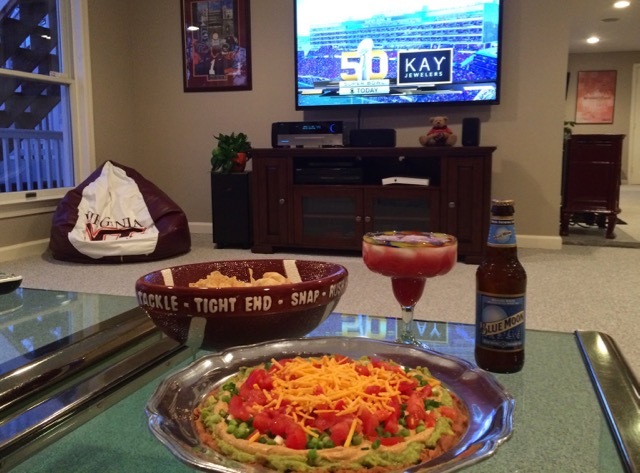 The layered dip would’ve been an excellent dish for the super bowl. Would you please share the recipes? Well, neither of those recipes are very healthy… The Texas dip is very easy. First spread refried beans on a serving plate. Next layer with guacamole, then one cup of sour cream mixed with a packet of taco seasoning. Add a layer of chopped green onions, then chopped tomatoes, and top with grated sharp cheddar cheese. The chicken parmigiana recipe is too long for a comment. Check back and I’ll try to share it in a post later in the week, or I’ll email it to you. Thanks Deb! I try to eat healthy, but got to splurge once in awhile! I’d really like the chicken parmigiana recipe if you would email it to me sometime. I don’t really “practice” yoga, but I do have poses/stretches that I do daily to help with some injuries and ward off others. Your Italian party sounds like fun! 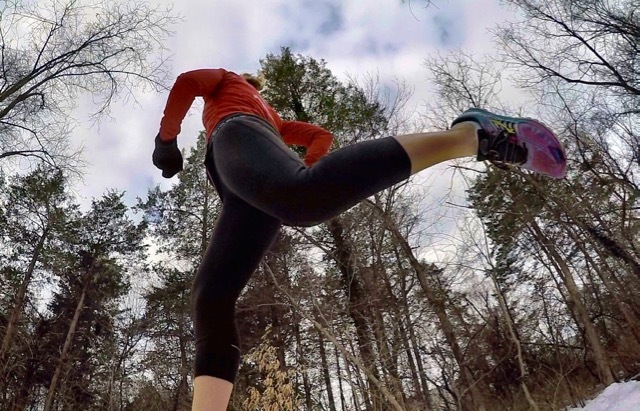 I do throw a few yoga poses into my workouts here and there, but I my goal is to be more consistent. And yes, the party was a blast! Your food looks amazing! Where did you get that running pasta? I use Rodney Yee’s yoga DVDs a lot. He’s got a Power Yoga one that I love. It really isn’t power but it is effective. The running pasta was given to me as a thank you gift last year by my MRTT chapter after I gave a presentation. I’m not sure where the chapter leaders found it, so I Googled it and found it at The Pasta Shop. Back when I attended yoga classes regularly, I bought a Rodney Yee VHS tape for home use. I really liked his style so I decided to stick with him when updating to DVD’s. Runner and shoe pasta is too funny! It looked yummy. You table looks beautiful. Great week of working out. I stretch a lot but don’t really do yoga. It is hard to fit it all in. Your dinner looks fantastic – and I love your china! I should check out those Rodney Yee DVDs. I’ve about worn out my AM Yoga For Your Week DVD. Yay for clear sidewalks! I’ve been spoiled with clear sidewalks for the past few weeks, but we’re supposed to get snow this week. 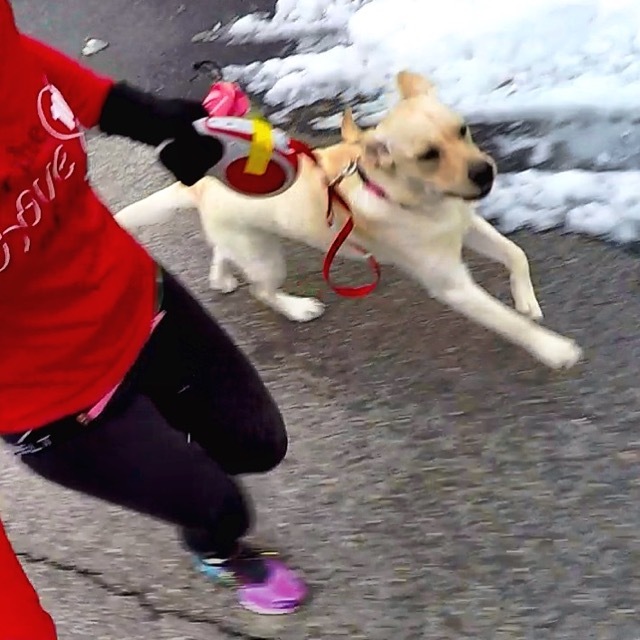 Running pasta? That is a first! I’m happy to hear your Italian dinner party was a success. I’m still laughing about Stella’s pawtar’s fasciitis. Your football bowl is so cute! We ended up going out for the game and appetizers but we didn’t stay for the whole things. At least I didn’t have to cook! Thanks for linking with us Deb! I have a matching flat football shaped tray and a football field tray, and didn’t think to get either of them out for my dip. Oh well,next year! I so need to quit talking about yoga an just do it already. I don’t know why it’s so hard ya know. 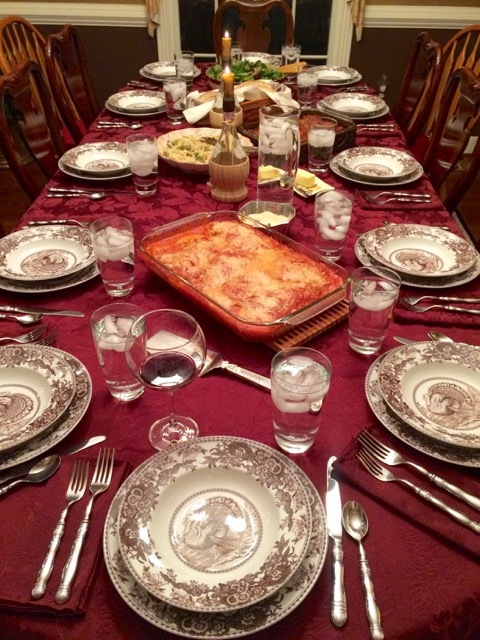 Your dinner table looks very nice I love the runner pasta. Where did you find something like that? Thanks so much Debbie for linking up with us this week! The runner’s pasta was a gift, but you can order it from The Pasta Shop. Your table looked so pretty for the party but the Cannolis in the photo really caught my attention. I have never seen runner pasta but I need to know where you can buy that stuff. It would be great gifts for so many of the girls in my running group. I wonder if they have bicycle shaped pasta too? The pasta was a gift, but with a little research, I found it at The Pasta Shop. Hope they have bicycles for you, too! sounds like a fun week! I finally downloaded a media player for my laptop so I can get back into my Yoga for Triathletes DVD. Good for you! I’m looking forward to starting yoga up again when my DVD’s arrive. Also, that margarita!? looks so good. Willing to share the recipe per chance? Mary Beth Jackson recently posted…It has been one heck of a week! Kim Hatting recently posted…So, What be the Haps? I remember shoveling snow and how much I hate it, That’s one of the good things about living in the south you don’t have to deal with the snow. Your table is beautiful and the food looks amazing. I sometimes have trouble fitting in Yoga, it always seems to be the easiest thing to leave out for some reason. Hope you don’t have much snow to shovel this week. I actually really enjoy shoveling snow, and that’s why I seem to keep doing it long after it really doesn’t need to be done. Funny thing is, I certainly don’t miss shoveling when the snow is all melted! Your dinner looked fabulous and I am glad you had a great Super Bowl! It is snowing again today here in NJ….eek! Thank you! 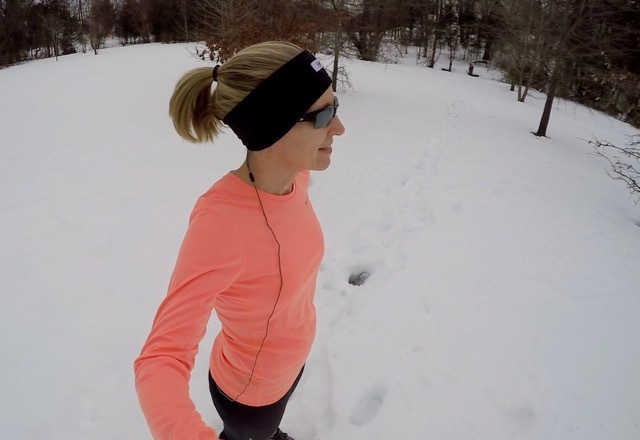 It snowed here this morning and was beautiful while I ran. The sun came out and most of the new snow melted by mid-afternoon (we still have a lot of snow piles leftover from the blizzard). Can I come over for dinner ? That looks amazing ! I have done some of the Rodney videos at my parent’s house. I liked it. Wow! That tablecloth looks great (and the food, too). I HATE shoveling. It cuts into my exercise time. But I think yesterday was only the second time this winter I’ve had to shovel & it was just a little bit! That makes me happy. I love yoga & try to do at least a little every day. I skip a day here & there, and most of the time it’s just 10 minutes, but I do think it does a body good. Thank you, and yes, the food was great! Good for you for fitting yoga into your workouts. I think ten minutes of yoga per day would be so good for me. I’m hoping my hubby and I can do a whole “class” once or twice a week, and then incorporate a few poses into our daily routines. OMG I NEED that pasta!! Wherever did you find it?! The pasta was a gift from my MRTT chapter for doing a cross-training seminar for them last year. I Googled it, and just added a link to my Deb Runs Facebook page since so many people are asking about it. You are a shoveling machine! Did y’all get anymore snow yesterday? We got nearly 8 inches down here with a nice layer of ice on top of that – you would be in shoveling Heaven! 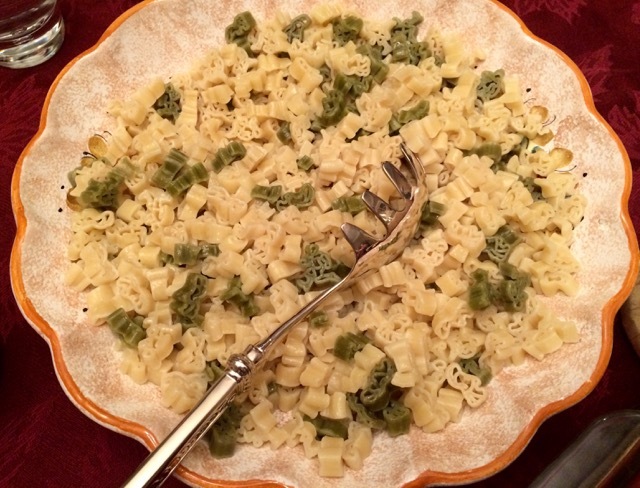 I love those runner and running shoe-shaped pasta pieces! That’s awesome. All of the food from your dinner party looks really yummy, too. So does that Blue Moon 😉 You know margaritas are not my thing, but a nice Belgian-style beer on the other hand…. We probably got about another four inches or so of snow yesterday. It started raining in the mid-afternoon and packed down the snow so it was heard to tell how much we really got.